The nature of whatever appeared was reality itself. In the town of Agarce there lived a wealthy householder, who had a thirteen year old daughter. She was betrothed to a man of her own caste, and as was the custom the young woman lived in her parents’ house until she was old enough to be her husband’s wife. During this period the Guru Kukkuripa came to her house begging food. Preoccupied with the significance of the Guru’s words, Manibhadra, for that was her name, neglected her work for the rest of the day, and then at nightfall she went to the cremation ground. 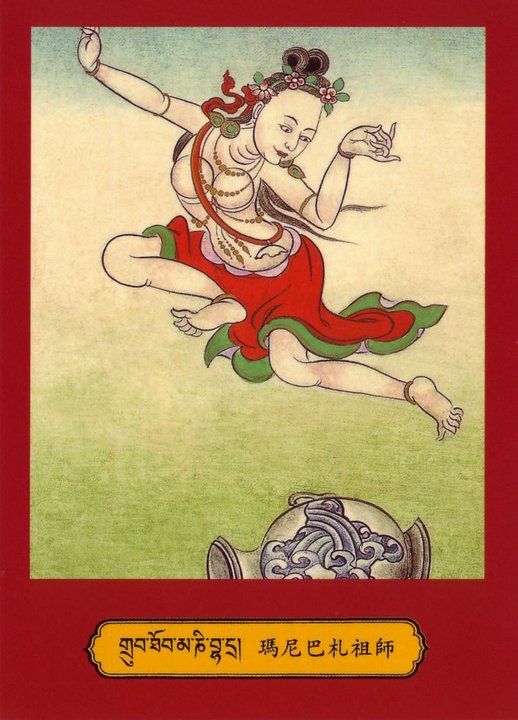 Kukkuripa recognized her spiritual maturity and gave her the Samvara initiation and empowerment together with instruction in the union of creative and fulfillment meditation. Thereafter she remained in solitude for seven days, establishing herself in the practice of her sadhana. But when she returned home her parents beat her and reviled her. Her words mollified her parents, who could find nothing to answer her with, and putting all thought of her housework out of her mind, Manibhadra began to practice her sadhana one-pointedly. After a year, when her betrothed came to take her to his own house, she accompanied him without demur. In her new home she performed everything that was expected of her cheerfully and uncomplainingly, always speaking modestly and sweetly, thus controlling both her body and speech. In good time she gave birth to a son and a daughter and brought them up in an exemplary manner. But why do they return home? I go on to pure pleasure. The Guru is truly wonderful! If you desire happiness, rely on him. So saying, Manibhadra floated into the sky and taught the people of Agarce for twenty one days. Thereafter she attained the Dakini’s Paradise. Source: ‘Masters of Mahamudra: Songs and Histories of the Eighty-Four Buddhist Siddhas‘ by Keith Dowman.